*** We have decided to reschedule the Catskill Trout Tales Fiver. Unfortunately the bowling alley is still under rehab. We are almost there with our kitchen and bar but not quite there. We are refunding everyone next week and will notify you of the November date. Please email Casey Pratt if you have any questions. 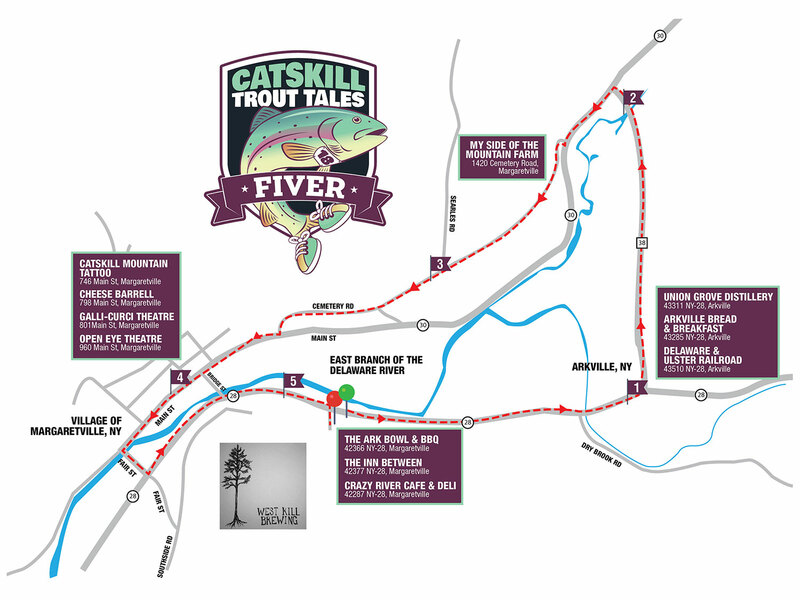 The Catskill Trout Tales Fiver is a 5.2 mile run along bits & pieces of the East Branch of the Delaware River - prime trout habitat. Afterwards enjoy a post race party that includes a BBQ, refreshments, LIVE music and of course, bowling at The Ark Bowl & BBQ, an 8-lane bowling alley located in Arkville, New York - the heart of the Catskills. "The Heart of the Catskill Mountains"
Distance: 5.2 Miles along the East Branch of the Delaware River, past farmland and through the Village of Margaretville. All finishers receive a snazzy finisher medal commemorating trout fishing in the Catskill Mountains. Benefits Margaretville High School Athletics. Sponsored by The Ark Bowl & BBQ and post race refreshments sponsored by West Kill Brewing. **Rooms fill up early in the Catskills due to a limited amount of accommodations – so don't delay! Please let the proprietor know why you are staying in the Catskills.